Community sits at the heart of all we do at the Oakland Literacy Coalition. While much has changed in the ten years since we first convened, our commitment to working together to ensure all children learn and love to read is stronger than ever. We are deeply grateful for our partners who are making a difference in so many ways, from meeting students’ basic needs knowing it’s hard to learn if hungry, unsheltered, sick, or stressed, to providing engaging and effective learning experiences in and out of school. We are proud to continue our work in collaboration with you to build an effective, connected literacy movement that supports all learners. We welcomed two new members to our team and increased our investment in trainings, workshops, and other opportunities for partners to build strong organizations and effective services. We broadened the network of stakeholders engaged in coalition programming and deepened how we support nonprofit providers through the launch of our formal Member Network. You can see our 18 current member organizations on our Member Directory and read about them on our blog. We supported spaces and tools to make effective collaboration possible, from Funder Dialogues to foster authentic conversations about foundation-nonprofit funding partnerships to the LitMap dashboard to map the landscape. Our Oakland Reads campaign continued to serve as an important platform to raise awareness and galvanize community support for early literacy. We intensified outreach to engage new community and faith-based partners and championed efforts to increase public action and investment in systemic solutions. We need you to keep this movement going strong! As we enter our third year as a nonprofit organization, we will continue to put down roots to sustain our work and grow new opportunities to support the field. We’re hard at work developing new ways for partners to plug in, access resources, learn, collaborate, and champion literacy together. For the many of you who’ve learned and collaborated with us, you are the proof in the pudding that we make better progress together. For all who believe in the power of partnership and community to drive change, we invite you to invest with us to continue to build a movement that knits together and amplifies the strength of our collective efforts. 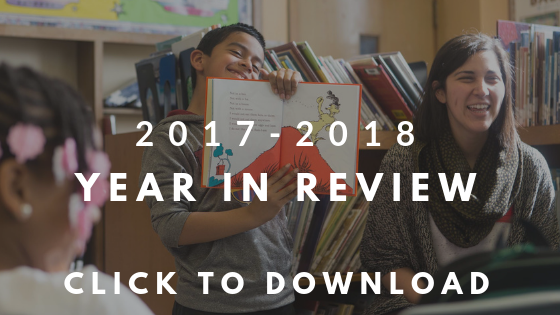 With your support, we will continue to bring this network together with new ways to link efforts, build capacity, and champion systemic solutions to make literacy a reality for all.